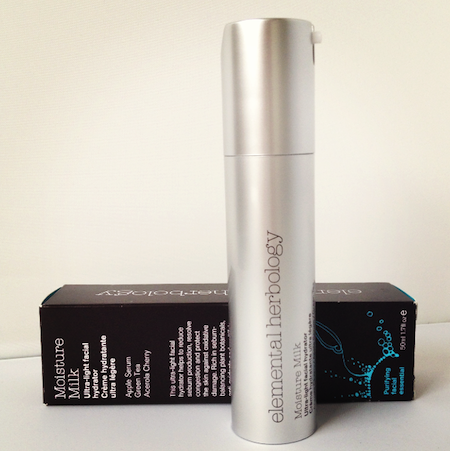 Elemental Herbology Moisture Milk – Rush Review! It’s very rare indeed that I review skincare after just a week – normally I like to leave at least a month to allow my skin to get used to a product and make sure that there are no weird longer term effects! It would be terrible if I raved about something prematurely and then it somehow turned my face into a pitted, grotesque minefield. Not only does this light gel-cream have exfoliating properties, it’s also rich in anti-oxidants and has antibacterial ingredients to keep skin clear and clean. A bit of a one-step wonder! The reason that I have rushed to review this Hydrator is that it’s perfect for hot and humid weather (now) and also for hormonal skin prone to outbreaks (me, now). It’s working an absolute treat on my skin, and it fills a bit of a hole where my night skincare regime is concerned – I was looking for something gentle-yet-effective that I could use between my Liquid Gold nights. Yes, you might say that it’s overkill on the Glycolic to be using this on my “off” days, but I haven’t had any adverse reactions so far. I might actually stop my Liquid Gold for a couple of weeks and stick to this little beauty! Just for a change. Whilst the weather is so changeable and my skin is threatening rebellion! I’ve just noticed that the directions say to use this as a morning moisturiser – oops! When will I ever learn to read the bloody instructions? I suppose that makes sense, what with the antioxidants. If you use it in the morning, make sure that you definitely, definitely use an adequate SPF. That can be a simple SPF15 in the UK, but make sure you apply to all of your face in a proper layer! Next Post The Ultimate Eyeliner Test!